We are also extending our circle of compassion and expertise beyond our borders with our Grand Challenges Canada (GCC) project in the Philippines, funded by the federal government. There are practically no mental health services available in low resource countries like the Philippines for mid and low-income individuals. The Centre, in partnership with Ateneo University and the Quezon City public school system, brought a mindfulness based intervention program to primary and secondary school children. 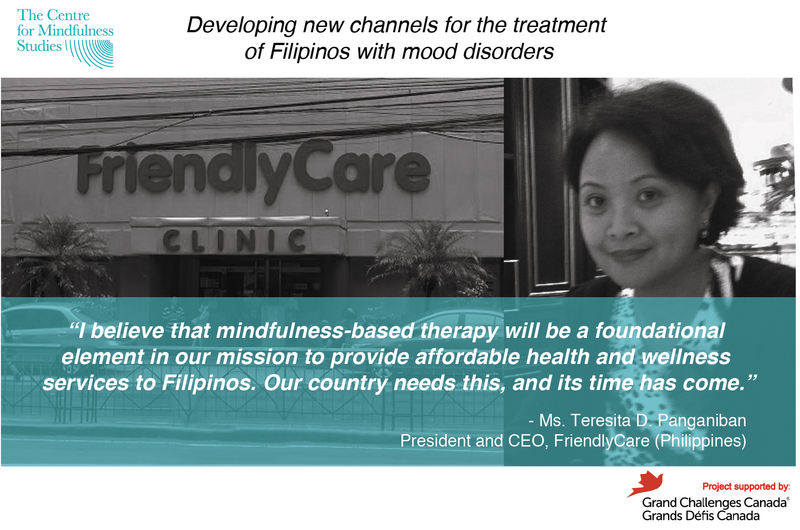 The Centre also partnered with Friendly Care, a primary care health agency, to provide mindfulness-based mental health services to their mid to low-income clients. This program trains non-clinicians and other “lay personnel” to deliver mindfulness-based interventions to individuals suffering from anxiety, depression, and other emotional disorders. The programs are provided in the local language and are culturally sensitive. With funding assistance from GCC, we intend to be scaled up to serve more Filipinos in key cities across the country.